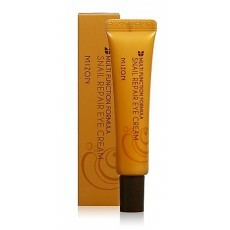 This is the sister snail product of Mizon's Bestselling Snail Cream to take care of the problems around the eyes. Formulated with 80% Snail Filtrate and EGF (Epithelial Growth Factor), this eye cream will smooth fine lines around the eyes and brightens dark circles. Squeeze a tiny amount of the eye cream and apply on the skin. Pat for better absorbtion.